Despite advances in the devices and techniques for endovascular occlusion of intracranial aneurysms, aneurysmal configuration remains a technical limiting factor in effective and safe endovascular occlusion. An aneurysm with a deeply bilobulated shape poses one of these technical limitations. In this report, we describe a technique by which we successfully treated three patients with these aneurysms. Three patients who presented with subarachnoid hemorrhage from ruptured bilobulated aneurysms were treated with Guglielmi detachable coils (GDCs) (Boston Scientific, Natick, MA). Two aneurysms were in the posterior communicating artery (cases 1 and 3), and one was in the anterior communicating artery (case 2) (Figs 1– 3). The Hunt and Hess grade was III in cases 1 and 2 and II in case 3. All patients were treated on the day of the hemorrhage. Case 1. 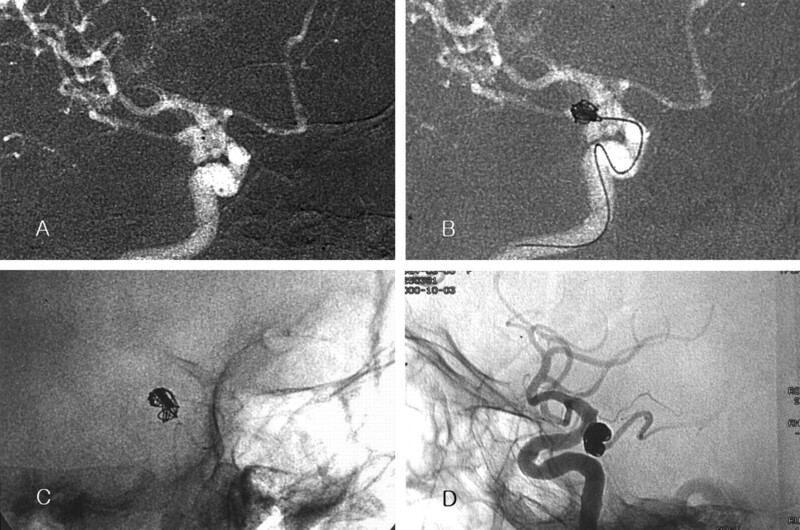 Images in a 76-year-old woman with a ruptured posterior communicating arterial aneurysm. A, Roadmap image reveals the bilobulated aneurysm. Note the position of the catheter tip (black dot in the aneurysm). B, The longest diameter of each lobe was 5 and 4 mm. When a 7-mm × 25-cm two-dimensional GDC-10 (GDC-10–2D) was inserted as the first coil, the coil frame did not occupy the whole inner space of the aneurysm. The coil was retrieved. C, A 9-mm × 30-cm GDC-10–2D is inserted. The coil frame matches the contour of the aneurysm. D, Postembolization angiogram shows compact coil packing. No contrast material fills the aneurysmal sac. A common embolization technique was applied: A microcatheter was positioned 1–2 mm from the isthmus between the two lobes (Fig 1A, 3A). The radial diameter of the first coil was determined by adding the longest lengths of the two lobes because the insertion of a coil with a smaller radial diameter failed to make a good coil frame (Fig 1B). A soft, long GDC-10–2D was used as the first coil, when available. When the first loop of the first coil was smoothly placed into one lobe, only further careful insertion was sufficient to make a good coil frame. The catheter tip had a swaying movement during coil delivery. The shapes of the coil frame exactly matched the contours of the aneurysm (Figs 1C, 2B, 3). When the first loop of the first coil was not placed into one lobe, it is inserted with slight advancement of the catheter tip with the first coil loop. After that, several millimeters of the coil were further inserted, and the catheter tip was slightly retrieved to the original position, that is, 1–2 mm from the isthmus of the two lobes. The next step was the same, and only careful insertion allowed the coil to be smoothly placed into one lobe and then into the other lobe. The radial diameter of the subsequent coil was the same or 1–2 mm smaller than that of the first coil. The position of the catheter tip rarely needed to be changed. If needed, slight retrieval or advancement was sufficient for smooth coil placement. As the coils were placed, only a small space remained around the catheter tip. This remaining space was occluded with small coils. Figure 4 is a schematic illustration of this technique. 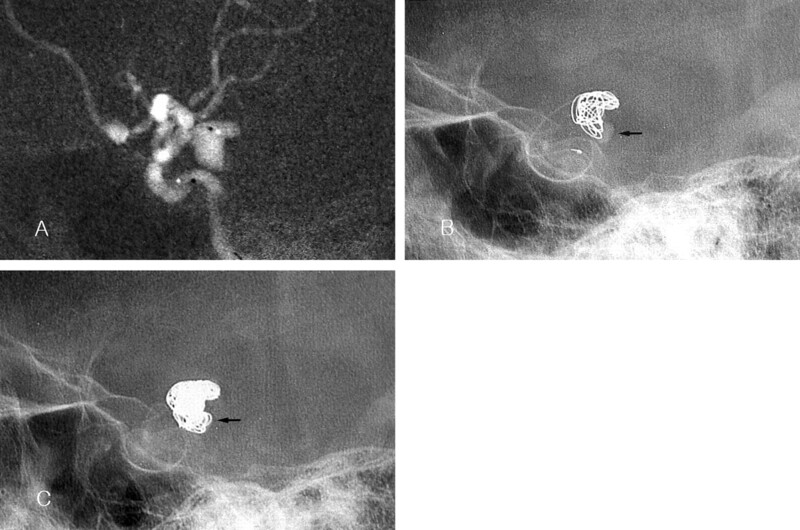 Postembolization images showed no filling of the aneurysms (Figs 1D, 3C). All patients had no change in neurologic condition after the procedures. At clinical follow-up, all patients had recovered and continued to do well. Case 2. Images in a 63-year-old man with a ruptured anterior communicating arterial aneurysm. B, The coil frame was made with the first coil, which matched the contour of the aneurysm. Note the position of the catheter tip (arrow). Case 3. Images in a 71-year-old woman with a ruptured left posterior communicating artery aneurysm. A, Roadmap image shows the bilobulated aneurysm. Note the position of the catheter tip (black dot in the aneurysm). B, The sum of the longest lengths of the two lobes was more than 10 mm. A GDC-10 coil (10 mm × 30 cm) was selected as the first coil. The frame made by the first coil does not exactly match the contour of the aneurysm. Note the contrast agent retention in the inferior lobe (arrow). Another 10 mm × 30 cm GDC-10 was placed after the first coil was detached. C, Final fluoroscopic image shows compact coil packing. The space with contrast retention in B is occupied with coils (arrow). Schematic diagrams of the figure-8 technique. A, A microcatheter is positioned 1–2 mm from the isthmus of the two lobes. B, After the first coil loop is placed into one lobe, another coil loop is made in another lobe with only further insertion. The catheter tip has a swaying movement during coil delivery. The coil loops may be shaped like a figure 8. C, Coils are smoothly placed into one lobe and then into the other lobe with just careful further insertion. In general, the subsequent coil has a diameter 1–2 mm smaller than the previous coil. D, Finally, the deeply bilobulated aneurysm is completely occluded. In the field of neurosurgery, lobulated aneurysms are well known to pose special challenges for surgical clipping (1, 2). Their large size and complicated configurations often compound the anatomic difficulties at surgery (2). Additionally, some have a greater propensity to bleed during surgery than other because they often have thin walls (1). As a less invasive therapy, coil embolization may be an alternative treatment for these aneurysms. Technical difficulties that may be encountered during the embolization of these aneurysms are somewhat different from those in surgical clipping. For safe clipping, wide dissection around the aneurysmal neck is essential. The large seize, multidirectional lobulations, and thin walls of the bilobulated aneurysms often make surgery difficult. In coil embolization, the configuration of inner aneurysmal space is important. Because the GDC has a circular shape memory, the aneurysms with bilobulating contours may not be good candidates for coil embolization. For these aneurysms, several techniques can be applied. First, each lobe can be selected and embolized separately, that is, after one lobe is occluded, the rest is treated. If each lobe has a suitable shape for coil embolization, this technique can be used safely and effectively. However, if it does not have a suitable shape, it may cause several problems. First of all, the selection of the second lobe may be difficult after one lobe is packed with coils. If large coils are placed in the first lobe, they may interfere the advancement of the microcatheter into the other lobe. If small coils are used, their placement in the first lobe may be unstable, and coil migration or displacement may occur. A double-catheter technique can be used. However, with this technique, two catheters should be simultaneously placed into one aneurysm. The parent artery must have sufficient inner space to allow the placement of both of the catheters while permitting blood flow to prevent cerebral ischemia. Thus, aneurysms that arise from large arteries, such as the internal carotid artery and vertebrobasilar artery, can be treated with this technique. However, most of aneurysms in small parent arteries, such as the anterior communicating artery, may not be good candidates for this treatment. A stent- or balloon-assisted technique can be use. However, these techniques also require the use of bulky instruments in parent arteries (3, 4). Compared with other techniques, our technique has an advantage of a conventional GDC embolization method. Therefore, it can be used in bilobulated aneurysms of small vessels. Although several technical considerations should be addressed with this technique, they are simple. First, the catheter tip should be placed under the isthmus between the two lobes so that the coil can be placed in one lobe and then the other. With coil placement in each lobe, the catheter tip changes its direction and position. We believe that this catheter movement helps to reduce the force of the coil against the aneurysmal wall. If the catheter position is fixed, the pressure of coils produced during their insertion may be directly transmitted to the aneurysmal walls. This may be one reason why procedure-related aneurysmal rupture is relatively common with a balloon-assisted embolization technique (5). Our technique requires more movement of the catheter tip in the aneurysm than that in the treatment of ordinary saccular aneurysms. Therefore, to prevent the direct transmission of the pressure produced during coil delivery or catheter movement to the aneurysmal walls, the fused part of the bilobulation at which the catheter tip is placed must have sufficient space. In addition, the catheter tip should be placed some distance from the isthmus between the lobes. When the space in which a catheter tip is located is too small, the catheter tip becomes relatively fixed. In this situation, coil and catheter movement can be dangerous. Therefore, we do not use this technique for lobulated aneurysms that have small and narrow common parts (ie, fused parts). The second technical point is the size of the first coil. In general, the radial diameter of the first coil is determined by the longest diameter of the aneurysm so that the coil is placed within an aneurysm to make a stable coil basket. When an aneurysm is spherical, the stress to the aneurysmal wall during the placement of first coil, which is sized to match the longest diameter of the aneurysm, is not so dangerous. However, when the coil is larger than the aneurysm, coil placement may be dangerous as well as difficult. We selected the radial diameter of the first coil by adding the longest lengths of the two lobes. For instance, when the length of one lobe was 4 mm and that of the other was 5 mm, we used a GDC with a 9-mm radial diameter as the first coil. Theoretically, the use of a coil with this size may be considered potentially dangerous because its radial diameter seems large and the coil basket is formed with some resistance; that is, the coil is placed in the two lobes in a figure-8 fashion. The coil should be bent, and this bending is achieved by pushing against the aneurysmal wall. Although our experience showed that this figure-8 embolization technique is safe, the coil bending which occurs against the radial coil memory may make interventionists nervous. This bending can be dangerous. Therefore, to reduce stress to the aneurysmal walls during the procedure, we use a 2D soft GDC as the first coil, if available. The selection of the size of subsequent coils is also important. One can easily expect that subsequent coil packing into the two lobes may be difficult because of the smaller radial diameters of the subsequent coils. If subsequent coils are not evenly placed into the two lobes, compact coil packing cannot be achieved. However, we did not encounter this problem in our cases. We placed coils with a radial diameter that was the same as or 1–2 mm smaller than that of the previous coil until only a small space remained around the catheter tip. Interestingly, these coils were easily placed from one lobe to another, in the same way the first coil was placed, even without any special manipulation of the catheter tip. Lastly, the remaining space around the catheter tip was occluded with small coils. We have no data regarding the long-term angiographic follow-up results. Recanalization may be observed if the patients undergo follow-up angiography several months or years later. However, we do not think that recanalization will occur more often than usual. Because the coils are placed in more complicated fashion, they may provide more resistance against hemodynamic stress. The pathophysiologic mechanisms of bilobulation can be considered to result from the growth of a daughter sac, the presence of bidirectional hemodynamic stress in an aneurysm sac, and the presence of intervening tissues such as tentorial edge or falx cerebri. Sometimes, a pseudoaneurysm may be seem like a lobulation of an aneurysm. Because pseudoaneurysms do not have stable walls, coil delivery into a pseudoaneurysm may cause catastrophic rebleeding from the aneurysm. Although some authors (6) report successful treatment of pseudoaneurysms with GDCs, they also recommend that this treatment is indicated only in select cases. Angiographic findings, including an irregular contour, delayed contrast agent retention, and unusual location, may indicate the presence of a pseudoaneurysm. However, we believe that no definite angiographic findings confirm the presence of pseudoaneurysms. Sometimes, these findings are observed on images of unruptured aneurysms. Also, during surgical procedures, we may encounter a true aneurysmal wall that had been thought to be a pseudoaneurysm on the basis of the angiographic findings. Nevertheless, when the findings from a careful inspection of the angiograms and medical history highly suggest a pseudoaneurysm, the application of the present technique should be reconsidered. Because every method in the treatment of pseudoaneurysms has a potential risk, the present technique is not an exception. The endovascular occlusion of deeply bilobulated aneurysms with GDCs is a technical challenge. Theoretically and practically, several coil embolization techniques can be applied in the treatment of these complicated aneurysms. Among them, our technique has an advantage of a conventional method. Although the method involves several technical considerations, such as positioning of the catheter tip and selecting the size of the first and subsequent coils, it is technically simple. In addition, this method can be used in the aneurysms of small vessels. We believe that this technique can be used for the endovascular occlusion of select deeply bilobulated aneurysms. Accepted after revision October 12, 2001.